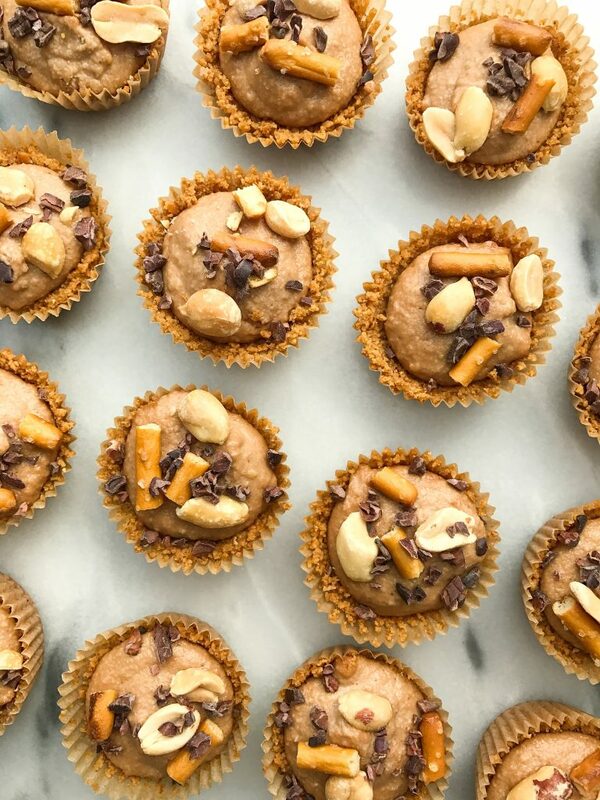 Chocolate Peanut Butter Pretzel Cheesecake Bites made with a gluten-free pretzel crust! It is likely that I will only be eating cheesecake made out of this pretzel crust moving forward. You guys, these cheesecake bites are SO GOOD. 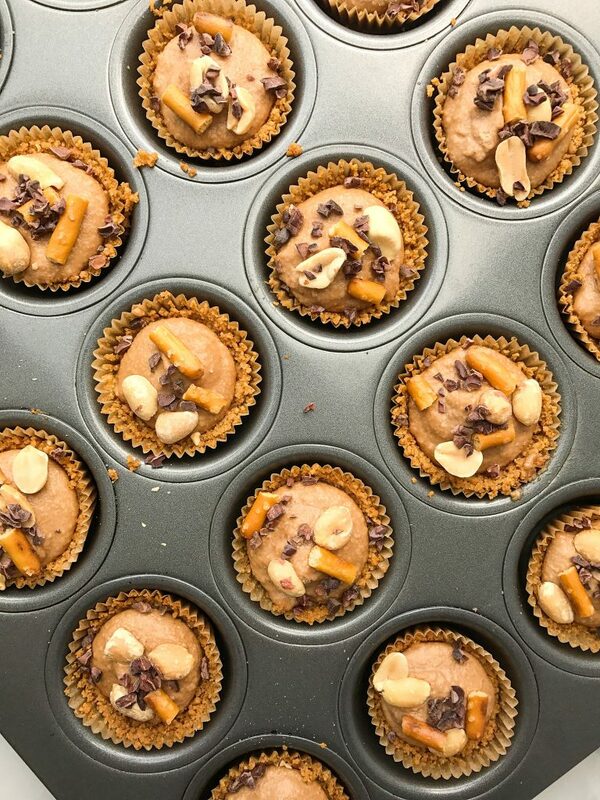 They’re the best mix of salty and sweet and don’t be fooled, they don’t have any cheese in them 😉 I personally am not a huge fan of your standard cheesecake so making a dairy-free cheesecake center is a dream. I don’t know why but the thought of eating ordinary cheesecake has always kind of made me squirm. But this crust though. That is the real star of the show because the cheesecake crust is made out of PRETZELS! Yup like the ones you snack on or dip in mustard. Or if you are my mom or myself, combine with potato chips and eat them together for the best salty snack imaginable. I used Glutino’s Pretzel Sticks in this recipe, making the crust entirely gluten-free and made with TWO ingredients: pretzels + butter or coconut oil (you pick!). 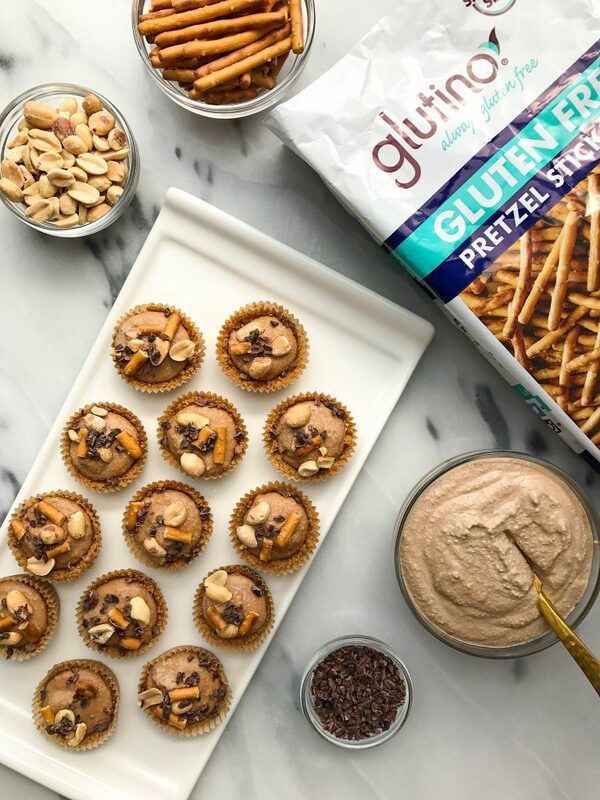 I use Glutino in a few recipes on the blog and love how diverse they are. You can eat their crackers, cookies, etc. right out of the box or mix them up in recipes like these. *Will keep in fridge for about a week or freezer for a couple of months! Thank you Glutino Foods for sponsoring this post. It means so much to me to work with brands that I love and who support rachLmansfield! Glutino Pretzels are the BEST! I’ve never tried a pretzel crust for cheesecake, but it sounds delicious. Next Post Butternut Squash, Black Bean & Egg Tostadas + GreenPan Giveaway!